Toy and gift manufacturer Deluxebase has expanded operations by moving its HQ to 4,000 sq ft offices in Beverley. The company has doubled its office space by taking the second floor at Armstrong House, part of regeneration leader Wykeland Group’s fast-growing Flemingate development. Deluxebase is the latest business to be attracted to Flemingate by an unrivalled combination of first-class premises, a high-profile location and superb amenities, including cafes, restaurants and dedicated parking. David Donkin, property director at Wykeland Group, said he was delighted to welcome Deluxebase to Flemingate. He said: “This move underlines once again that Flemingate as a first-class business location. “As Beverley’s first Grade A office development, Armstrong House offers high-quality, modern premises in a central position in the town, with excellent facilities all around. Established in Beverley in 1994, Deluxebase has a warehouse near to Beverley and offices in Hong Kong. Its nature-themed toys and gifts are supplied to thousands of tourist attractions, gift shops and toy shops and two of its biggest local customers are The Deep in Hull and Flamingo Land near Malton in North Yorkshire. From its new headquarters, Deluxebase controls product design, sales and shipping for customers across the world. 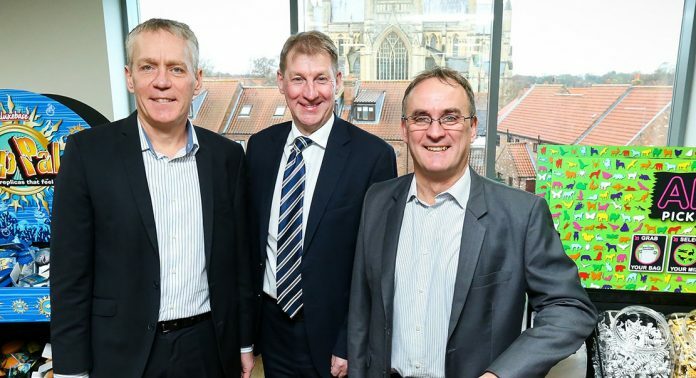 Deluxebase has relocated from offices in Lairgate, Beverley, and Director Phil Hudson said: “We didn’t have the space we needed in our previous offices, so Armstrong House has given us the room we needed to continue to grow the business. Armstrong House offers spacious, open-plan offices which benefit from comfort cooling and daylight dimming lighting, as well as shower facilities and dedicated parking spaces, in addition to contract parking available in the 500-space multi-storey car park within the Flemingate development. A total of 3,500 square feet of office space remains available on the first floor, which can be sub-divided into smaller suites, with potential occupiers encouraged to enquire about Armstrong House without delay. Deluxebase is the second company to choose Armstrong House for its new headquarters, following a successful move by Local Transport Projects (LTP), which supplies professional traffic engineering, transport planning and highway design services to the public and private sectors.